Previously, Josh served as the Director of External Affairs in the Office of the President at UAB where he worked on strategic projects in a portfolio of issues in community engagement and economic development. In 2016, Josh spearheaded a partnership between 15 partners and 30 employer sponsors to secure $6 million grant from the U.S. Department of Labor, and he led a team to train 925 disconnected youth for high-demand, high-wage IT jobs in Birmingham. The program, Innovate Birmingham Workforce, had an 85% graduation rate in the first cohort, and of those who completed, 100% earned a high quality credential and nearly 80% obtained high-wage jobs. A Rhodes Scholar, Josh earned his M.Sc. in Comparative Social Policy and a D.Phil. in Politics at the University of Oxford where his dissertation explored the intersections of the political participation and healthcare access. 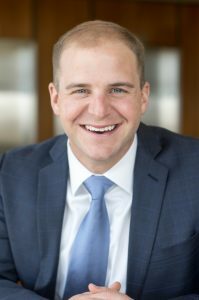 Josh was named a young Global Shaper by the World Economic Forum, and he is currently a member of the Aspen Institute’s Inclusive Innovation in American Cities Collaborative. Josh teaches in the UAB Collat School of Business and researches how job attainment alters notions of efficacy.